BENTON HARBOR, MI – Three of the biggest rock and roll acts and stars of the sixties will appear in concert at The Mendel Center at Lake Michigan College on Saturday, April 6, at 7:30 pm. 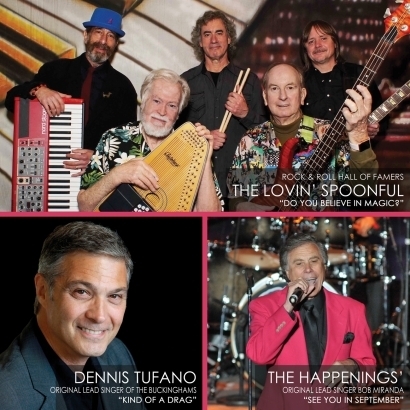 The show features the Lovin’ Spoonful and the original lead singers of the Buckinghams and the Happenings. Headlining the concert is one of the biggest American hit-makers of the era, The Lovin’ Spoonful. Together, the Lovin’ Spoonful produced some of the most iconic recordings of the ‘60s folk rock revival. The group’s first hit, “Do You Believe in Magic?,” climbed the charts in 1965. Recording 8 top-selling albums, they ruled the radio with a string of feel-good hits that followed their “magical” debut including “Did You Ever Have to Make up Your Mind?,” “Nashville Cats,” “You Didn’t Have to Be So Nice,” “Daydream,” and the ultimate anthem for a hot summer night, “Summer in the City.” Amazingly, all of these songs hit the Top 10. The group splintered in 1969, but re-grouped in 1991 with three original members and has been crisscrossing the country ever since, keeping their unique blend of pop, rock, and folk alive. The group holds the distinction of being inducted into the Rock & Roll Hall of Fame in 2000. One of the most successful American rock and roll bands of the late sixties was Chicago’s Buckinghams, fronted by the inimitable signature voice of Dennis Tufano. The Buckinghams’ music was so ubiquitous in their heyday that Billboard Magazine named them “The Most Listened-To Band in America” in 1967. Tufano’s Buckingham classics include “Don’t You Care,” “Kind of a Drag,” “Hey Baby! They’re Playing Our Song,” “Susan,” and “Mercy, Mercy, Mercy.” He will sing all of them during his appearance at The Mendel Center. The Happenings’ hits include "I Got Rhythm," "Go Away Little Girl," and "See You in September." The latter was a #1 hit not only in the United States but in several other countries around the globe, and, yes, original lead Bob Miranda can still hit those high notes just like he did in their heyday. Originally from New Jersey, their records featured soaring falsetto notes and lush arrangements, not unlike that “other” group of Jersey boys. The Happenings are still in demand in South America, touring there frequently, and their popularity in the Philippines has exploded in recent years, but Bob is always happy to play for their die-hard American fans. Tickets for Stars of the Sixties are on sale now starting at $35. They are available at www.TheMendelCenter.com and through The Mendel Center Box Office at (269) 927-8700, option 1, weekday 10 am to 6 pm. Discounts are available for groups of 10 or more, seniors, students and children, active military members, and veterans. For information about group rates, pre-show party options, and other special arrangements, contact the box office. For information about ‘50s, ‘60s and ‘70s concerts around the country, visit www.poprockdoowopp.com.